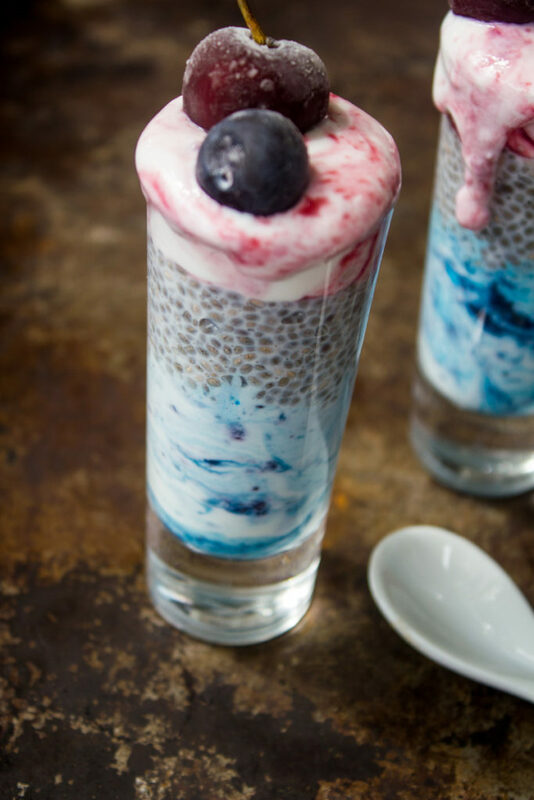 Blueberry Cherry Chia Pudding Parfaits for Breakfast or Dessert! These Blueberry Cherry Chia Pudding Parfaits are SO good, perfect for breakfast OR dessert! Also patriotic which makes them a fun summer treat! Is it just me or does it feel like summer is flying by? Or better yet… the year. How are we halfway through the year at this point? At any rate, it’s true and it’s happening. And in less than 2 days we will be celebrating the 4th of July. This week the Sunday Supper Tastemakers are bringing you a whole collection of Red, White & Blue goodness to help you celebrate! I chose this recipe because it IS Red, White & Blue. But it’s also our favorite treat to enjoy on a hot summer day – whether for breakfast or simply as an end of the day dessert. On Sunday night I usually whip up a batch of Chia Pudding because honestly it’s better the longer you let it do it’s thing. It also lasts about 5-6 days in the fridge so if you make it up ahead of time, you are pretty much set for the week. And you can use it to make all kinds of delicious things like smoothie bowls, and cute little Blueberry Cherry Chia Pudding Parfaits. Because… why not? I also make the fruit sauces up ahead of time. They are pretty simple to be honest – and they also last for about a week in the fridge. I use the fruit sauces for pancakes, waffles, muffins, smoothies, yogurt, oatmeal and more. Oh, and of course these delicious Blueberry Cherry Chia Pudding Parfaits! If you stick around after the recipe, you’ll find a whole wonderful collection of Patriotic Red, White and Blue recipes that are sure to be perfect for your patriotic plans! 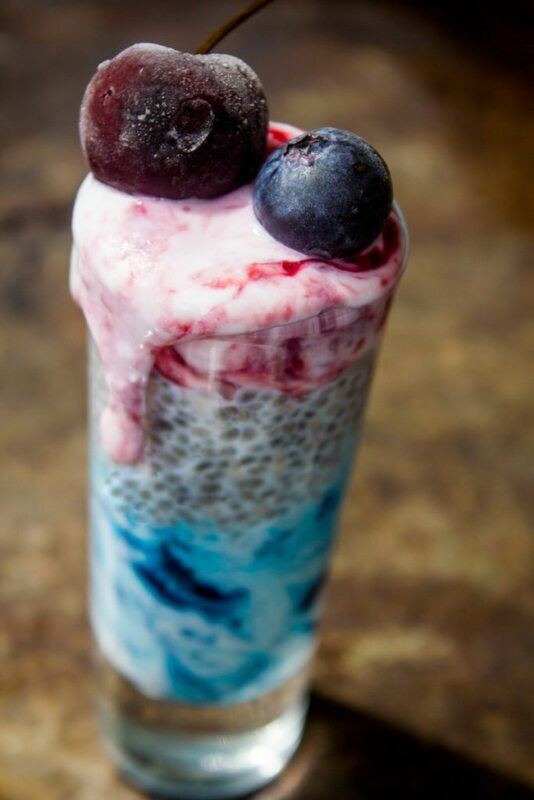 Ready to make up some Blueberry Cherry Chia Pudding Parfaits? Prepare Chia Pudding and Fruit Sauces in advance. 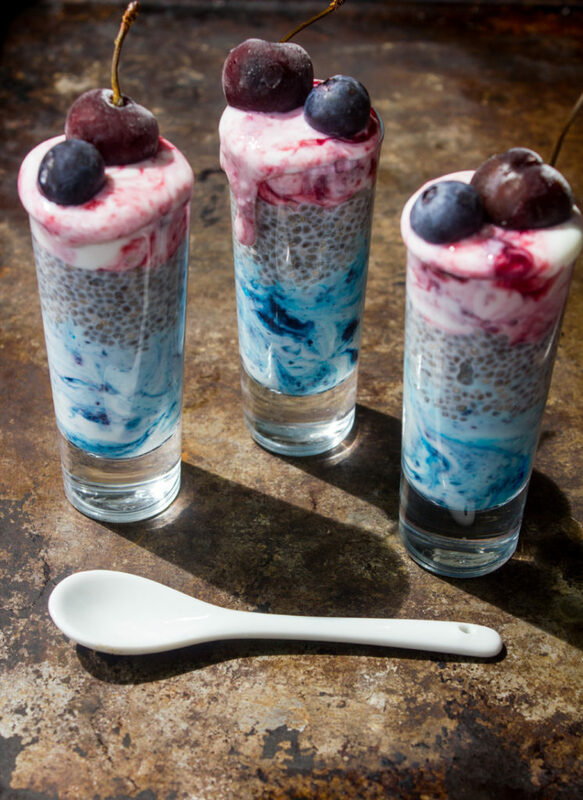 The day before you want to make the parfaits, prepare the Chia Pudding. In a jar with a lid, combine the chia seeds, milk, syrup and extract. Screw the lid on tight and shake. Shake some more. Baby, you're just gonna shake, shake, shake, shake, shake, you shake it off, you shake it off. Er... Shake it up. I know - bad. Once you've shook it well, place in refrigerator for at least 4 hours though I strongly recommend overnight. In a small saucepan, heat the cherries over medium heat. Cover the pan. Cook until they start to become juicy. Usually about 10-15 minutes does the trick. In a small bowl, combine the cornstarch with the sugar and then pour the mixture into the cherries. Stir well. Put on low heat, bring to a simmer, and cook until the sauce has thickened, about 2-3 minutes. Remove from heat, let cool and refrigerate for up to a week. In a small saucepan, heat the blueberries over medium heat. Cover the pan. Cook until they start to become juicy. Usually about 10-15 minutes does the trick. In a small bowl, combine the cornstarch with the sugar and then pour the mixture into the blueberries. Stir well. Put on low heat, bring to a simmer, and cook until the sauce has thickened, about 2-3 minutes. Remove from heat, add a couple of drops of blue food coloring (only if desired) let cool and refrigerate for up to a week. In a small bowl, combine 1 cup of Greek yogurt and stir in 2-3 tablespoons of cherry fruit sauce. In another small bowl, combine 1 cup of Greek yogurt and stir in 2-3 tablespoons of blueberry fruit sauce. In a serving dish, spoon a couple of tablespoons of the blueberry yogurt mixture into the bottom. (I usually do about 1/4 cup). Top with another couple of tablespoons of Chia Pudding. Top with another 1/4 cup or so of cherry yogurt mixture. Garnish with a cherry and blueberry and serve. Delicious and healthy. Thanks for sharing. I just finished my mid-morning chia pudding snack. Your red white and blue version is certainly a lot more festive AND delicious with cherries and blueberries! This summer is definitely going way too fast. I love chia pudding for a quick breakfast. I haven’t used chia seeds much but this recipe may change that! YUM! I need to pick up cherries and try this soon. Thanks! These would be fun for a summer party!